A misdemeanor is a criminal charge where the maximum sentence is a year or less in jail. Misdemeanors in Oklahoma include some DUI charges, petite larceny, possession of drug paraphernalia, assault and some domestic violence charges. When you have been charged with a crime, even a misdemeanor, you have the right to an attorney. You also have many other important rights and protections afforded to you as a criminal defendant. If you have been arrested or charged with a misdemeanor, you need to call an Oklahoma City misdemeanor defense attorney right away. The sooner you contact the Wirth Law Firm for a consultation, the sooner you can have an attorney in your corner. Some people mistakenly think that because a criminal charge is a misdemeanor, it is not a serious charge. Any criminal charge is a serious one. Even a misdemeanor conviction can lead to a year in jail and several years of probation. Other criminal sanctions can also be imposed should you be found guilty. A misdemeanor conviction may affect a defendant’s ability to get employment, join the military, find housing, and can even influence child custody proceedings. A misdemeanor conviction can be the first stop on the road to a felony charge. Many crimes that are a misdemeanor on first offense may be charged as a felony on the second or third offense. In a misdemeanor charge you might encounter less aggressive prosecution than on a subsequent offense charged as a felony. It’s urgent that you fight for your rights early before you accumulate a criminal record that can follow you for a lifetime. When you have been arrested or charged with any crime, you need to find an Oklahoma City misdemeanor defense attorney to walk you through the criminal justice system. You need someone who will argue your side of the facts and make thoroughly review all of the available evidence in your case. When you go to court, the district attorney will have law enforcement officials, lab technicians, and investigators on their side. Who will stand up for you? When the prosecution presents the charges and evidence against you, how are you going to counter? 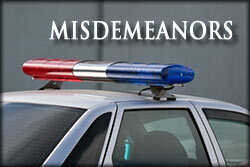 You need an Oklahoma City misdemeanor defense attorney to be by your side as you appear in court. You need an attorney who is ready to vigorously defend you. Don’t face the criminal justice system by yourself. Make sure your rights are fully protected and you are fully represented. Face your charges with the confidence that an experienced and knowledgeable attorney is by your side. For a free consultation with an Oklahoma City misdemeanor defense attorney call the Wirth Law Office- Oklahoma City Attorney at (918) 213-0950. You can also submit an email question from the top right corner of this page. Our Oklahoma City criminal attorney will respond as quickly as possible to all questions.